Now we’re getting into a tricky area to try to forecast the rosters. Instead of just having to consider the upwards movement of players through the organization, by the Double-A level, we also have to take into account the major league roster and where players can get blocked. At the Double-A level we’ve also got minor league free agents to worry about — where they slot in (particularly at the Triple-A level) — and work our way down while also trying to figure out who merits a promotion from one of the A-ball teams. This is what I’ve been able to come up with. Because of the need to wait for the fallout of big league Spring Training, it’s very hard to figure who’s going to be in the rotation for the Fisher Cats outside of Sanchez and Bibens-Dirkx. Deck McGuire may be on the losing end of a numbers game that would have him back in New Hampshire for the third straight season. I think that the Blue Jays want to show their faith in him after putting him on the 40-man roster but with so many pitchers that are going to be clogging up the Buffalo rotation, there’s a good chance that he ends up back in Manchester. Ditto for Marcus Walden who has an invite to major league spring training. John Anderson is kind of a swing-guy who might be in the bullpen only because the Jays don’t want to put any more strain than necessary on his oft-injured left arm but I definitely think that he’s done enough to merit the promotion to Double-A. A big chunk of the Fisher Cats relief corps from 2013 became minor league free agents and the Blue Jays didn’t re-sign them. 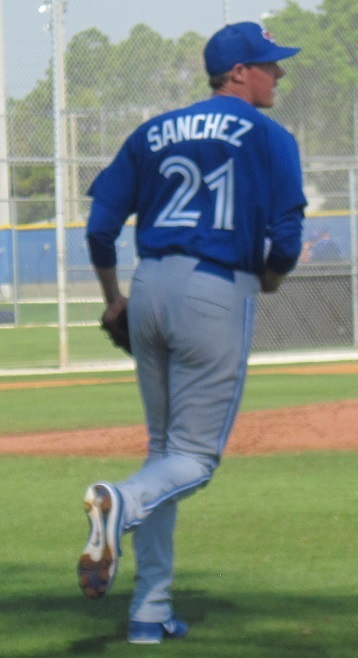 I think that the Jays believe that they have more than enough arms coming up from Dunedin to fill the void. Tepera has a star next to his name because he could easily be in Buffalo to work out of the bullpen in 2014. Here is where the catching logjam really starts to get interesting. The Blue Jays have pretty much come out and said that they’re going to have A.J. Jimenez back in Double-A to start the season; that piece of information came out when the Jays signed Tomo Ohka. I think Jimenez could easily start in Buffalo but there are complications with that theory too. The Jays already have three catchers slated to start in Triple-A (the loser of the back up catcher competition between Thole and Kratz, Mike Nickeas and Sean Ochinko who starts the season serving a suspension) and my gut feeling is that the Jays’ brass wants Jimenez to be the every day catcher wherever he goes. Derrick Chung’s role in this dance will probably be as a backup to Jimenez for the first few months of the season unless the Jays want him to go back to Dunedin although I’m fairly convinced that he doesn’t have anything left to prove there. Murphy has been an excellent soldier for the Blue Jays organization and I could see him either backing up in Buffalo (despite the already crowded situation there) or New Hampshire but he’s been playing some other positions and could be a utility guy as well. Finally, if Chris Schaeffer isn’t in Dunedin, he’ll be a backup in New Hamsphire but, as I’ve said, I don’t know how many roster spots are going to be available. I think there’s going to be a big freeze on movement for the 2013 Double-A guys like Nolan, Burns and Schimpf. With the minor league free agents that the Blue Jays signed this offseason (all infielders like Jonathan Diaz, Jared Goedert, Andy LaRoche and Munenori Kawasaki), there’s not going to be a lot of room for the New Hampshire gang. I think K.C. Hobson and Jon Berti get the promotion from Dunedin but that’s about it. As much as I would like to see Gabe Jacobo in Triple-A, I have a gut feeling that it won’t happen. The Blue Jays have pretty much acknowledged that they’re thin in the outfield at the higher levels of the minors. With the crowded Triple-A level that will likely have guys like Brad Glenn and Kevin Pillar anchoring the outfield (possibly with one of Gose or Sierra if the Jays sign a fourth outfielder or right-handed DH), there’s going to be a trickle down effect and, in my opinion, I think Kenny Wilson will be back in New Hampshire and you may well see guys like Jack Murphy, Gabe Jacobo and Ryan Schimpf (and possibly Andy Burns) getting time in the outfield. If Kenny Wilson moves up to Triple-A, Crouse is your every day center fielder. If he doesn’t, Crouse will get every day at bats in right, I would think. Who do you think plays in New Hampshire? Have I missed anyone? Intersting list. I’m wondering if Ajay Meyer will be in Manchester or Dunedin. His numbers have been great in A-ball, but his stuff seems rather *blah* to me and I’m wondering if the glass slipper may drop on Cinderella here. He has a funky side arm slot, but an 86 mph fastball I don’t believe is gonna cut it. Definitely some decisions to be made. Ajay Meyer’s fastball is faster than 86 mph. Where speed is essential in pitching technique and placement are key. Which he obviously has because his numbers show it compared to some crazy fastball pitchers out there. I think he stands a good chance with everyone else that is on the list. I didn’t expect to see some who didn’t have a great year last year. Moises Sierra won’t likely be at Buffalo; he’s out of minor league options. You’re right that he’s out of options but I’m not entirely convinced that Sierra’s going to be on the big league club. He could get lost on waivers or traded but, on the other hand, he could get through waivers, much like Jeremy Jeffress did last year (whether or not that had to do with Jeffress’s epilepsy diagnosis as well as his history is another story). I think that if the Jays don’t add a right-handed bat between now and March 31, Sierra will have a bench job in Toronto but if the Jays do sign someone, Sierra could be on the outside looking in, especially if he doesn’t have a good spring (or if he’s just a trainwreck at first base).